'Self-drenching' craze in deaf community Jump to media player The deaf community's new craze for drenching themselves. Who is Kid President? Jump to media player BBC Trending goes behind-the-scenes with YouTube star Kid President. Who is the mysterious donor giving thousands to gamers? Jump to media player A mystery person using the handle 'Ahmai' is showering cash on video game streamers. #BBCtrending: Preacher v Selfies Jump to media player People in Indonesia are posting selfies to protest an Islamic preacher's declaration that they are arrogant and narcissistic. Snow day superstar: #Blizzardof2015 'Frozen' parody goes viral Jump to media player A teacher in Rhode Island adapted the Oscar-winning song 'Let it Go' to tell students to stay home. China's drinking binge Jump to media player What's behind the dangerous Chinese drinking game Baijiu Challenge? "Americans, this is pointless" Jump to media player A recent thread asked non-Americans what they found strange/pointless about the American way. 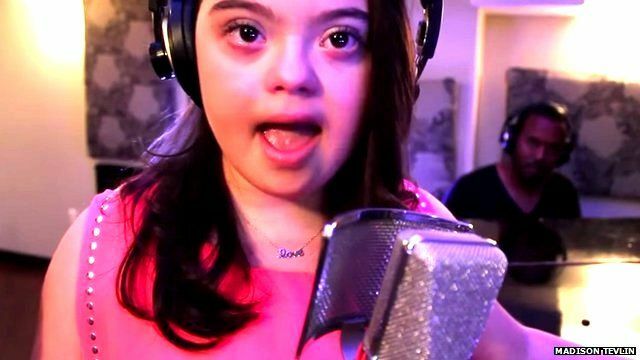 A Canadian teenager with Down's syndrome has become a hit on YouTube after recording a cover version of a John Legend song. Madison Tevlin's rendition of All of Me has been watched almost five million times and has been described as "inspirational" and "amazing." But it has also attracted criticism.